Electric underfloor heating is becoming more and more popular in Ireland. The ultra low installation costs, the quick and easy installation method and the superior ability to control all make electric underfloor heating incredibly attarctive. The Hotfoot team is on hand to view your current room plans and suggest the most suitable underfloor heating solution for your space. Feel free to simply email the house plans to info@hotfoot.ie and we will outline your options with a solution best suited to your requirements. 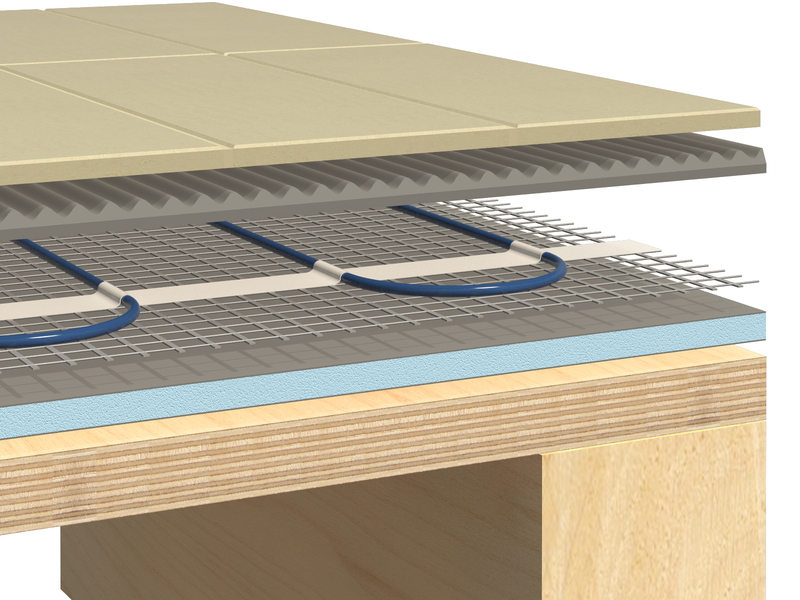 Calorique Underfloor Heating Mats are a combination of a heating cable attached to a fibreglass mesh scrim that makes installation easy. The mat can simply be rolled out onto the floor saving precious time. The mats have double sided tape on the underside so they can easily be fixed to any clean surface and are the perfect electric underfloor heating solution for all stone and tile floors. 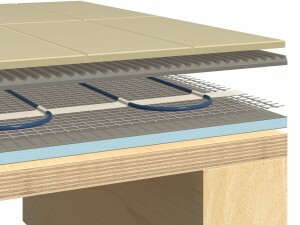 Calorique Underfloor Heating Mats have a twin conductor cable simplifying installation with a single 3m “cold tail” connection. Available in 2 standard power outputs: 100 Watts/m² mats are suitable for underneath wood or laminate surfaces & 150 Watts/m² mats are ideally suited to concrete sub-floor or if being placed on Marmox insulation board – Essentially areas where high heat losses can occur. Each heating mat comes with a full installation guide and 25 Year Warranty. Calorique Radiant Heat Film also provides the luxury of electric underfloor heating to living rooms, bedrooms, hallways, loft conversions and conservatories or almost anywhere a laminate, engineered wood or real timber floor is being laid. 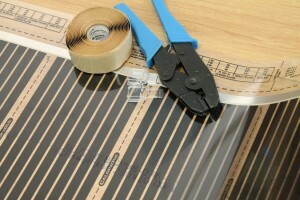 It is an ultra thin carbon based heating film which also comes with a 25 Year Warranty. ing heating system fits nicely into a John Rocha designed apartment in Dublin. Calorique Perfectly Warm Film can also be supplied pre-wired. Only a simple 2 wire electrical mains connection is required. Please contact us directly for more details on this product. Calorique film is rated at 90W/m2 for wooden sub-floor areas and 120W/m2 for concrete sub-floors. Calorique’s radiant heating film has an ultra-thin profile which in turn has a minimum effect on finished floor levels, an important consideration when laying floating floors. 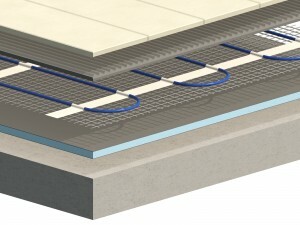 It can be laid on most sub-floors, concrete or timber, when used in conjunction with marmox board thermal insulation. Calorique’s Radiant underfloor heating film produces the optimum heat distribution in any room by using the whole area of the floor to radiate heat. This means that the air temperature can be lowered by 2-3 degrees over a conventional convector system while still maintaining a comfortable environment – all easily controlled by full programmable thermostat. Heat loss calculations should be performed before using Calorique’s Radiant underfloor heating film as the sole source of heating. Consult your Architect or heating engineer. Alternatively, see www.calorique.com for online support tools. The running costs can be related directly to the floor heat-up times. A well insulated sub-floor will significantly reduce heat losses, improve heat-up times & reduce your monthly heating bills.